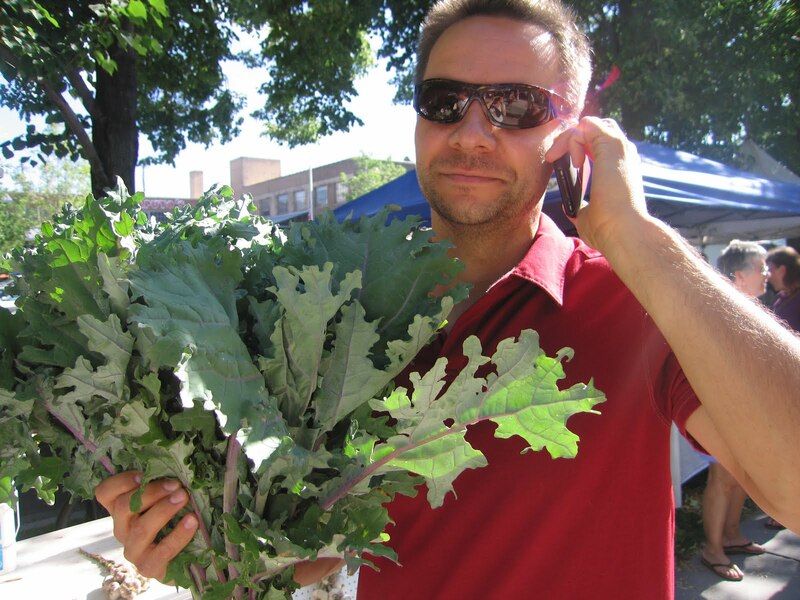 This is a picture of my sweet husband Bill holding a huge beautiful bunch of kale at this years Farmer’s Market. He’ll kill me for putting this picture on the blog but I did so because this post is about one of his favorite dishes “sausage” and kale, I usually make this dish for breakfast on the weekends. When I first posted that recipe he told me that I should make mention of it at least once a month because he thinks that if you try this dish you’ll become a kale loving convert like him. So this morning while making a winter fruit salad for breakfast I had planned on making the “sausage” and kale dish as well, I looked in the fridge and realized my mother-in-law Pauline had left us some of her sausage stuffing from our Thanksgiving meal we shared on Friday. I tossed that in with the regular recipe I use for the “sausage” and kale and it was wonderful! It was extra savory and made this staple dish something a little more special. Toss some of your leftover stuffing in with some hearty winter greens (kale, collards, watercress, spinach and arugula) and you have a fun new side dish for any time of day. 1. Start with the sausage and kale recipe, follow the directions. Just before you start to add the kale add your leftover stuffing to the pan. 2. Follow the directions form the sausage and kale recipe until the end. Don’t forget to add a squeeze of lemon juice and a drizzle of olive oil.